Close to 7,000 people visited Araluen over the weekend for the opening of Desert Mob 2018. Right: Artists and audience gathered for the opening. 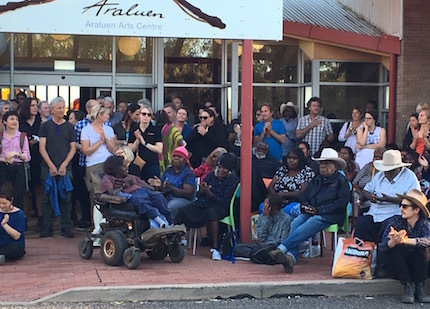 The exhibition brought together 257 artists from 31 Aboriginal art centres across the desert lands of the NT, WA and SA showcasing 262 works of art, with a total price value of almost $940,000, the highest amount since 2009. This puts Desert Mob on track to eclipse last year’s record of $1 million in sales between the exhibition and Marketplace (for “affordable” work). This was already a 68% increase from 2015 and the highest sales achieved in Desert Mob’s history. The MarketPlace on Saturday drew around 3,000 people, generating sales estimated at over $500,000.